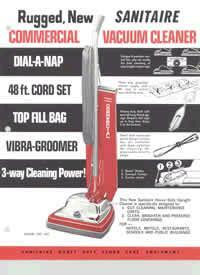 Sanitaire Heavy Duty Blue vacuum cleaners were first offered to consumers beginning in the 1950s. Iin 1972, The Eureka Company launched the Red Sanitaire product line for commercial users after repeated requests from commercial customers like you. The commercial cleaning industry was still relatively small at the time as on-site cleaning crews independently managed most hotels, businesses, schools and healthcare facilities. Our Sanitaire commercial line of products aided early commercial cleaners in saving time and money while providing top cleaning performance and durability. Cleaning crews got more "mileage" out of these new commercial products because they were built to last. Innovative product design made it possible for the user to replace parts and maintain their own products without taking them in for service, in addition to providing top quality filtration and eliminating the need for bags. Sanitaire commercial products have been serving commercial cleaners for over 30 years now. And, with over 5 million units sold, our long-lasting vacuums are truly durable - with reports that some have been using the same Sanitaire vacuum for over 20 years! Today, the Sanitaire commercial line is part of Electrolux Home Care Products North America, and our commitment to create affordable and durable cleaners that live long and work hard continues on. 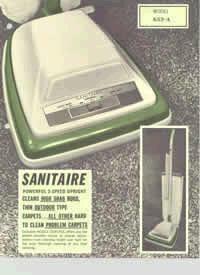 2003 - Sanitaire line expands beyond vacuums to include air movers, floor polishers, etc.